The Carol Zulu Primary School has 270 students currently enrolled. Though we provide a great service to the local community, we lack the classroom space to serve the 1,500 children who remain on our waiting list. Additionally, 39% of adults in Zambia are illiterate, including most of our student’s parents who have no opportunity for learning to read and write. We are seeking $57,500 to build 4 new classrooms. When we complete this classroom block we will then build one last block which will include a library, computer lab, and 2 additional classrooms. This will complete phase 3 of the Carol Zulu Primary School construction. When she was first introduced to 12 year old Carol Zulu, Kathy Headlee had no idea that her life had just been forever changed. Carol was a bright, happy 12 year old, who, due to abuse, malnutrition, and disease, was seriously ill. Despite her challenges, Carol was a light to all who met her. 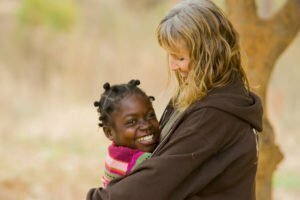 Kathy took Carol back to the Mothers Without Borders facility in Lusaka, Zambia where she could be in a safe, loving environment. Though she was only with MWB for 3 years before dying due to complications of HIV/AIDS, Carol left a legacy of love, forgiveness, and joy in the face of adversity. Carol understood the importance of education. Before she died, she repeatedly made Kathy promise that Mothers Without Borders would build a school where Carol’s cousins, siblings, and friends could all get an education. Mothers Without Borders has named our new school the Carol Zulu Primary School in honor of the promise Kathy made to Carol. Through the generous donations of many, our school is equipped with curriculum designed to assist in rapid advancement of the students. In a country where only 60% of 7th grade test scores are passing, we have maintained a 100% pass rate since we opened in 2010.